Jack Lazor has put together an overview of some traditional avenues to market for your grain crop, below. Every producer of grain crops, large or small, ends up selling their harvest in one way or another. Perhaps the easiest and least complicated form of grain marketing is to feed one’s grains to dairy or meat animals. Farm raised livestock are not very fussy and won’t reject a load of grain because of weed seeds or foreign matter. Farm produced livestock rations are easy to formulate. Ration balancing isn’t an exact science. Flexibility in ingredients is possible, because different grains may be substituted for each other. Until recently, official grain buyers and merchants were not to be found in Vermont. Champlain Valley Milling, across Lake Champlain, in Westport, NY was the nearest purchaser of wheat for its milling operation. There have always been organic feed mills in Pennsylvania looking for grains to manufacture layer and broiler rations. A trucking bill for a 400 mile grain shipment to a distant market is more than most people have wanted to pay. Vermont now has one very active feed mill: Morrison’s Custom Feeds of Barnet, which has been looking for local grain sources. Les Morrison and his son have been building their own grain infrastructure for the past several years. More storage bins, a soybean roaster, and a giant elevator leg have been added to the operation. In the fall of 2009, the Morrisons installed a brand new continuous flow grain dryer and began purchasing wet corn right off the combine at field side. This has been a real service to farmers, since they do the trucking and the drying. Morrisons has also been quite good about buying hard red bread wheat that doesn’t make the grade for human consumption. The livestock feed market is certainly not the most lucrative, but it is less exacting and reliable. Grain for human consumption is the first choice of most grain growers. Bread and pastry wheat is in the highest demand and the easiest to sell. Markets for large amounts of wheat and other bread grains are limited, except to large milling concerns like Champlain Valley Milling. This is probably not a viable choice for the small to medium sized grower because you are in the commodity market. Standards are exacting, prices lower, and price negotiation is usually part of the game. Some Vermont bakers have their own stone mills and they are constantly looking for high quality wheat. Clean, high quality wheat with good falling numbers and adequate protein is a prerequisite. Operating a farm based flour mill is also another possibility. Freshly ground flour can be sold be sold to bakers, food co-ops, and other outlets. This is certainly another farm enterprise requiring its own infrastructure, but the profits will repay the investment. Other grains can also be processed on the farm. 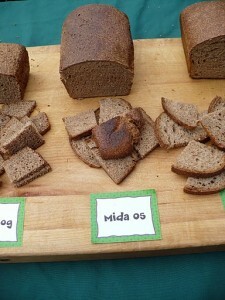 High quality rye flour made from ergot free rye is a popular item. Corn meal for human consumption can be ground coarsely or finely on the same stone milling machinery as wheat or rye. High test weight, hard textured corn is best for milling. The flint corns and open-pollinated varieties generally make better corn meal than the modern hybrids. Demand for spelt and oat products is off the chart, but these grains need hulling and other processing in order to reach the ordinary consumer. Oats are higher in fat than any other grain, so they must be stabilized with heat by steaming or drum roasting. Other on-farm enterprises can provide an outlet for homegrown grains. A simple tractor-driven grinder-mixer can be employed to grind corn, soybeans, oats, barley, wheat, and peas into various livestock feeds for cows, pigs, broilers, and laying hens. The recipes are simple and not set in stone. Different “nutri-balancers” and mineral additives are used for each particular grain mix. A diverse and varied approach is probably the best one to take in marketing grains here in the North Country. A mixed farming operation that includes livestock, hay, and grain is probably the best choice for success. This spreads out risk and allows us to dodge the vagaries of the weather. Hay crops can be “seeded down” underneath cereal seedings. The straw stubble left after cereal harvest will catch snow the first winter and protect the tender new hay seeding. Straw from cereal crops can be kept on the farm and used to bed cattle and then in turn to make compost which will nourish the land for future hay and grain crops. Everything fits together in one holistic system. Diversity is our best friend. For more information and resources on marketing organic grains at premium prices, click here. There is no reason we can’t extend the CSA (Community Supported Agriculture) model that has been so successful among northeast vegetable farmers. For a brief how-to see: Developing a Grain CSA, written by the folks at Wheatberry Bakery and Cafe in Amherst, Massachusetts.